Q. How Many People Typically Attend the Live Trainings? A. Both the online and in-person versions of this workshop are capped at 20 participants. This is to ensure plenty of individual attention and a nice cozy learning and sharing environment — so you get lots of direct interaction and feedback with me and your fellow participants. Q. Who Comes | What Are Other Participants Like? A. People probably a lot like you. People who’ve been intrigued by this work for years or just stumbled upon it and are totally excited by its existence. People come from lots of different kinds of professions, the obvious ones like leaders, managers, consultants, facilitators, trainers, coaches, counselors, and scribes. And illustrators, graphic designers, cartoonists and artists. But also Human Resource professionals, public speakers, authors, architects, city planners, landscape designers, mediators, teachers & principals, college professors, community activists, NLP practitioners, astrologers, youth workers – even lawyers and accountants (cause they totally need to get things across to their client base in an easier way and working visually does the trick). The really cool thing is where you and your fellow participants are from. For the in-person workshop most are North American … from across the United States and Canada. However, Europeans have made the trek to work in-person with me too – from United Kingdom, Ireland, and Netherlands. As well as Aussies, New Zealanders and even Pacific Rim travelers (Singapore, Japan, etc). Now with the online version of the program, our participants are across the full English Speaking world! Having such geographical diversity is great — lots of connectedness and support (members of our global visual tribe uniting). Q. When Will You Offer Again? The Online Training is usually offered twice a year in the October – December season and again in the February – April time period. Watch the website and eZine for Early Bird deadlines to save. I used to offer the In-Person training more often however that has shifted due to working online. So the In-Person Training now is only offered once a year. Usually three days in early June. Given its rarity it typically sells out, so register early to secure your spot. Watch the website and eZine for Early Bird deadlines to save. FYI, to make the most of your travel experience, consider also signing up for the advanced 2 Day Magic Marker Retreat, intentionally scheduled right after the fundamentals class for those who want back-to-back training all in one trip. Prefer private, customized training for your unique needs? Work one-to-one in beautiful Victoria, British Columbia, Canada. We just find a date that works for both our schedules. Includes Home Study Kit so you can prep ahead of time if you like. Private Training and Apprenticeships. Have a group of people to be trained in your organization or community? Happy to customize this training for the needs of your group. Let’s find a date that works. Bring me to you for customized In-House Training. Q. What If I’m Scared by the Drawing/Art Stuff? Rest assured, it’s really not about art anyways – it’s about information capture, and good process work and having another way to help your clients! If drawing isn’t your strongest point, please know that I break things down to the most simple basics, plus you have other strengths you can capitalize on like good listening, synthesizing and tracking of information. For more info see my article: How Non-Artists Can Work Visually Too. HUGELY ENJOYABLE AND IMMEDIATELY APPLICABLE! EVEN THOUGH I HAVE NO DRAWING SKILLS … I SEE THE ‘LIGHT’ – EVEN I CAN DO THIS! Q. What If I Already Have Experience in the Visual Field? A. While you do not need to be an artist to do Graphic Facilitation or Graphic Coaching (being a good artist can actually slow you down) … your skills will come in handy for Studio Work and Graphic Recording. Because this work is not ‘art’ per se, you will have other skills you’ll need to develop in order to effectively do this work, that I can help you with (learning about agenda design and process, listening effectively, capturing ‘the logic trail’, formatting in a rational way, etc). If you already have some experience with Graphic Recording or Graphic Facilitation, then you’ll have a nice base that I can help you build on. Most intermediate and advanced folks who come to my training learn a LOT (especially in the technology, mindset and business building areas). I meet you where your current skill level and lifestyle is and get you to your next level. Also, see Magic Marker Retreat for advanced instruction (this Fundamentals course or equivalent experience is a pre-requisite). Q. 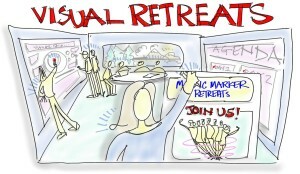 Are You Training Us On Your Visual Coaching Tools? A. No, this workshop provides you with the fundamental, underlying skills you need to do general visual work with groups and individuals, not my trademarked SHIFT-IT System®. 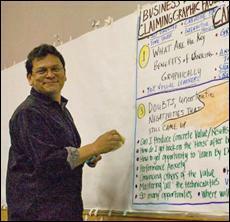 However, I do have a full Certification program that trains you in Visual Coaching methods, including use of my 17 maps. 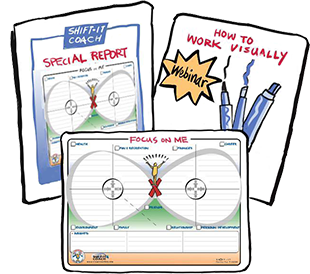 This Fundamentals Course is a pre-requisite to become a Certified Visual Coach. For more info, click here. Q. I Can’t Attend Live, What Is Your Home Study Option? 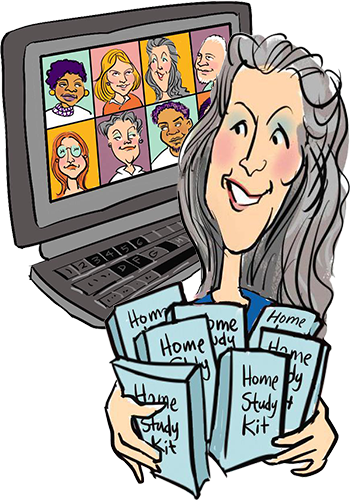 A.The Home Study Kit contains the same information as the live training (in fact you watch a live online training and follow along as they go through the material). This Kit allows you to access my training from the comfort of your own environment and control the pace and timing of your learning. Great for people who ‘want it NOW’ and/or who can’t attend the live classes for various reasons. Full Details and Instant Online Purchase. Q. I Want Customized Training, What Can You Do? A. I’m happy to customize this training to your specific needs. 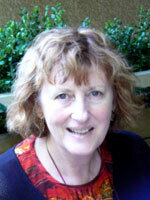 I do offer private one-to-one (or small group) training in beautiful Victoria, British Columbia, Canada. See Private Training & Apprenticeships (you come to me). Alternatively, if you have enough people in your organization or community, see In-House Training (I come to you). Q. Do You Offer Scholarships or Discounts? A. I come from an organizational development / corporate background. As such, my service fees and training rates reflect those circles. As the visual way of working grows, more types of Process Professionals, who work in various environments serving various client populations, are rightfully interested in developing visual skills. Given the value of my work and material, I do not discount it. Instead I offer generous Early Birds, Seasonal Sales and Payment Plans. However, I am open to discussing partial scholarships for people who are genuinely from or serve disadvantaged populations or topic areas. To inquire about the possibility of a partial scholarship, simply email admin@shift-it-coach.com and include a thorough explanation of why you are seeking a scholarship and for how much. I or my assistant will get back to you after I have considered your request.